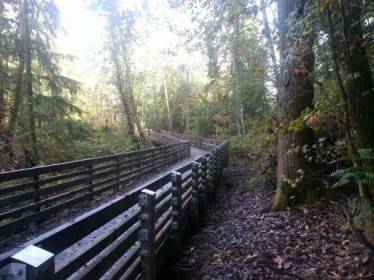 In spring of 2005 the City of Bonney Lake contracted a landscape architecture firm to plan a general trail route through the Fennel Creek corridor in Washington State. The trail was designed to parallel the creek within the creek buffer to allow trail users to experience the sights and sounds of the woodlands and pastoral scenes along the creek corridor. After years of planning, ground was broken on the Fennel Creek Trail in April of 2013. Portland Bolt was contacted to supply the domestically manufactured bolts for the project in May 2013. Due to funding from the Washington State Department of Transportation, all of the fasteners on the job were required to be manufactured in the USA. Over 10,000 carriage, hex, lag, and timber bolts were needed for trail construction. Portland Bolt’s ability to hot forge headed bolts, roll threads, and hot-dip galvanize allowed us to control the lead time through our facility and keep the project on track. Keep Portland Bolt in mind for any project requiring domestically manufactured bolts or large nonstandard fasteners. The first portion of the project was completed in October 2013. 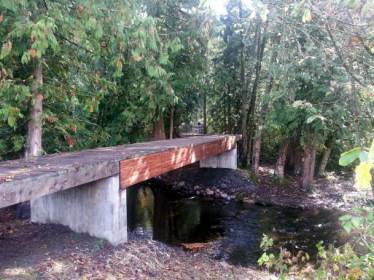 Over 500 feet of heavy timber trail, handrails, and bridge were constructed during this segment of the job. The trail will provide a safe multi-use recreation area for walkers, bikers, and horseback riders.